July 19, 2011 By This post may contain affiliate links. 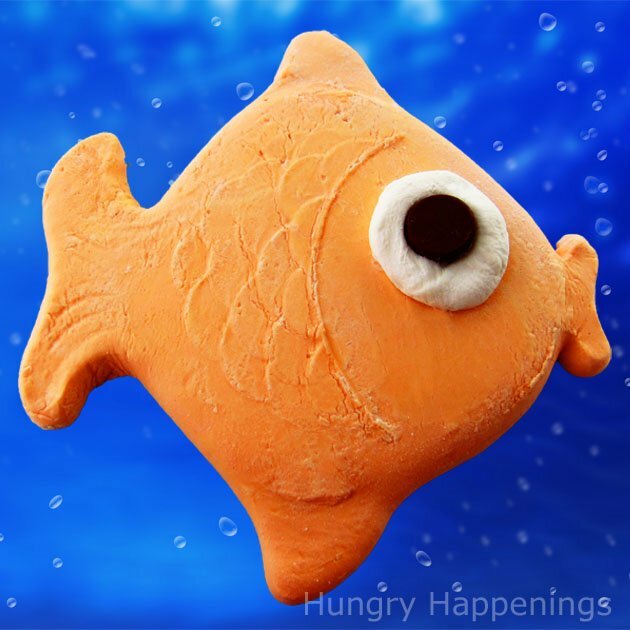 Use sand molds to create these fun Marshmallow Sea Animals! They are great for any party and are so adorably fun to make. 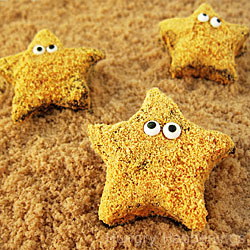 In my last post, I showed you how to make homemade marshmallows to create Starfish S’mores. I had a few people write to me to ask how to make the marshmallows if they didn’t own a stand mixer and I suggested using a heavy duty hand held mixer, and stopping the mixer several times, so the motor can cool down, during the whipping process. Today, I will offer you an even simpler solution. Use store bought marshmallows. How, you ask, can you take a cylindrically shaped marshmallow and turn it into a star for the starfish or perhaps a goldfish, as pictured above? Melt it! To create the goldfish, I poured a bag of store bought marshmallows into a large bowl and heated it in the microwave until the marshmallows were melted, added yellow and red food coloring, and a few drops of orange flavored oil, just to change the flavor a bit and make it seem more homemade. Then I poured the melted marshmallows into a mold that is usually used to make shapes in the sand at the beach. After it hardened for about an hour, I un-molded it and added a marshmallow and Hershey’s Kiss eye. If you would like to use this technique to make the Starfish S’mores, just melt 20-24 ounces of marshmallows and pour into a 9″x13″ pan that has been buttered and sprinkled with a mixture of cornstarch and powdered sugar. Allow the marshmallows to harden for at least an hour and proceed with the recipe. 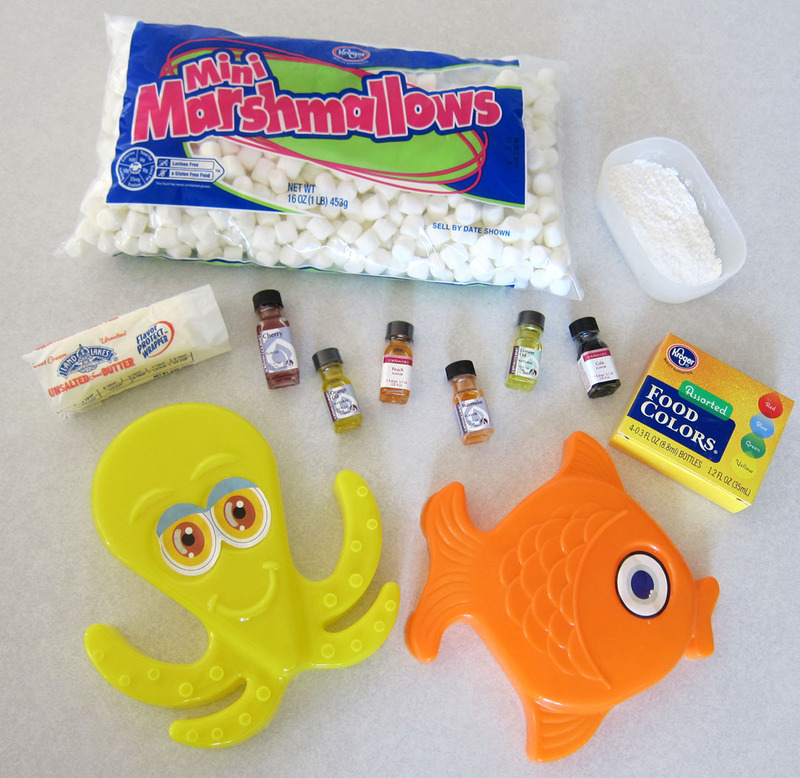 Conversely, you could use the homemade marshmallow recipe to create the goldfish or other shapes using sand molds. I found my goldfish and octopus molds at the Dollar Tree, but saw so many different molds at various stores and online. There are even molds for movie and cartoon characters. Be sure to shop for them in the summer, even if you want to make these another time of year, unless, of course, you are fortunate enough to live by the beach where they sell them all year ’round. and Hershey’s Kisses or large chocolate chips, M&M’s etc. NOT PICTURED – Butter a piece of plastic wrap and line the mold with the butter side up. Combine corn starch and powdered sugar. Sprinkle into molds. Shake mold allowing powdered mixture to get into all nooks and crannies of the mold. Tap out excess, reserving for later use. Be sure to do this before you melt the marshmallows! You have to move very quickly once they are melted. Butter the inside of a large microwave safe bowl and a large rubber spatula. Pour marshmallows into bowl. Heat in microwave on high power for 20 seconds. Stir using buttered spatula. Heat for 20 more seconds. Stir. Heat for 20 seconds. Stir. If marshmallows aren’t melted, continue to heat for 10 second increments, stirring after each, until melted. If desired, stir in drops of food coloring and drops of flavored oil. To make the orange, I used 6 drops of yellow and 2 drops of red food coloring and 5 drops of orange oil . Spoon (or pipe – see the next set of photos), the marshmallow into your mold. Sprinkle some of the cornstarch/powdered sugar mixture over the marshmallow. Press down on the surface of the marshmallow. This will smooth out the surface and allow you to push the marshmallow into the lips and fins. If you don’t sprinkle on the powder, your hands will stick and the marshmallow will pull up and out of the mold. Allow the marshmallow to harden in the mold for at least an hour. I colored this marshmallow purple by adding 8 drops of red and 6 drops of blue food coloring and flavored it with 5 drops of grape oil . 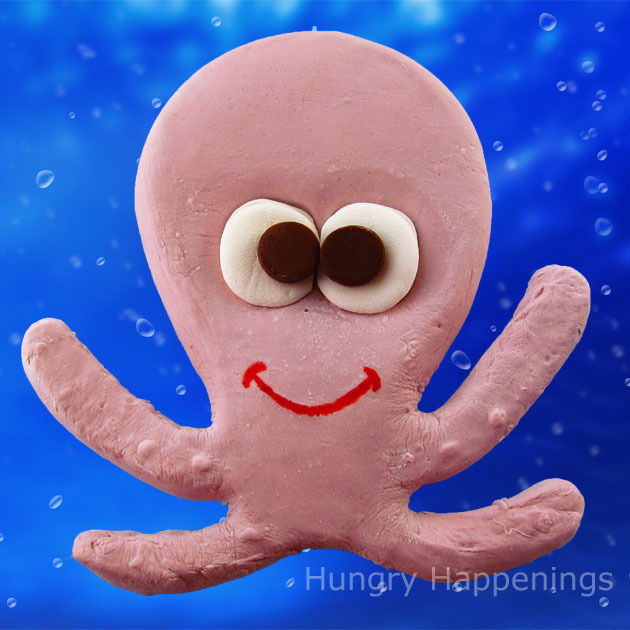 If you have a mold like the octopus that has long thin legs or other appendages, I suggest you fill a large pastry bag or zip top bag with the melted marshmallow and pipe the marshmallow into the mold. Then dust with the cornstarch/powdered sugar mixture and use your hands to press the marshmallow into the mold. Sprinkle some of the cornstarch mixture onto your work surface. Turn the mold upside down, and begin to peel the marshmallow away from the edge of the mold at one end (the tail fin.) The marshmallow will stick in a few places, so just carefully pull it away from the mold, unsticking as needed. Set marshmallow on the cornstarch/powdered sugar dusted work surface. Brush any excess powder off of the fish using a pastry brush. To make the eye: cut a large marshmallow in half widthwise. My marshmallow wasn’t quite big enough to cover the entire eye area, so I microwaved it on defrost for 5 seconds, then placed it on the marshmallow fish. I sprinkle it with cornstarch/powdered sugar and used my finger the spread it out into a nice round shape, let it dry, and dusted off the excess powder, then topped it with a Hershey’s Kiss. You could use frosting, cookies, candy, or food coloring to add decorations to your marshmallow animals. For the octopus, I added marshmallow and Hershey Kiss eyes and drew on a smile using a red food coloring marker. Set your marshmallow sea creatures on a serving platter and use as the centerpiece of your pool or beach party. You can cut them or just have the guests tear off pieces to enjoy. You can even use small sand molds to make individual party favors for your guests. Have fun! Previous Post: « Add edible googly eyes to your modeling chocolate and fondant figures. thanks for the fast and fancy approach, I like that very much! I was at Dollar Tree yesterday and saw some super cute sand molds and wishing I could do something with them. I am so excited to see this idea. I will have to go back and buy them now and get busy. Thanks so much for sharing. I'm SUPER excited to try them. Oh my goodness….these are way too cute! I love your S'morefish ! They look so Moreish! Mini versions would be perfect for Bentos! Thanks everyone. I went back to Dollar Tree to pick up something and all of the sand molds were 50% off. Can't beat that! You can use any candy mold, soap, or candle mold to make these. Small versions would be great for Bentos. I am so in awe of bento artists. To be a kid who gets to eat a creative bento everyday for lunch – wow! 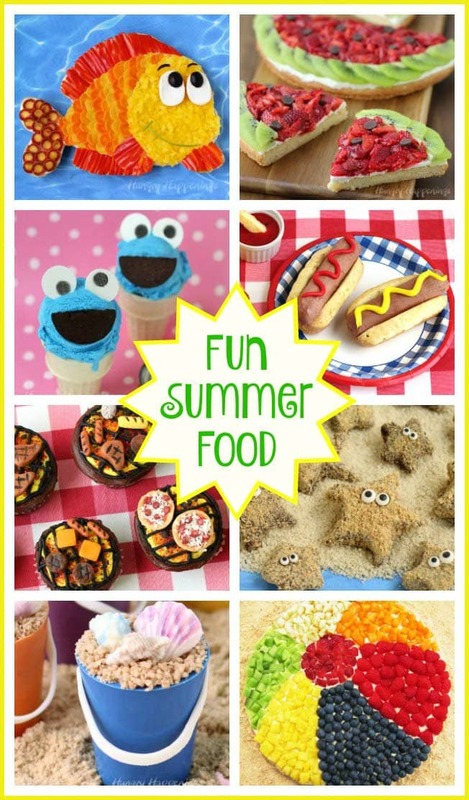 If you haven't been to Tiffany's website, Cute Food For Kids, you must check it out. Thank you so much for sharing these fishy treats on Momtrends Friday Food. What are you going to do next with marshmallow! I adore all the clever and tasty creations that are posted. Have a terrific weekend and stay cool. Cari, So happy you made marshmallow sea creatures for your party. Your cakes turned out amazingly cute. There are so many different sand molds and your turtle and crab made perfect cake toppers. Oh mo gosh! Cutest edible fish ever! Thanks for the link. I do appreciate it! I really love this project and hope your readers like it too. It's fun, I like it ! I put a link to your article on my french blog. Hi Miss Cuisine, thanks for the post. I tried to leave a comment on your blog, but wasn't able. I do appreciate you featuring my recipe! I am loving this and your starfish from the other day. I think I will have to try these while on vacation with my kiddos! My daughter and I have gone vegetarian and so can't eat Peeps at Easter anymore (gelatin is made from animal byproducts). I found a "peeps" mold, but wasn't sure how to melt the vegetarian marshmallows I bought. This afternoon, thanks to you, I'll be making us some animal-free peeps! I've not ever had marshmallows that aren't made with gelatin. I'll have to look for some at my health food store. Maybe I can figure out how to make them from scratch. Have fun making your Peeps! Saw this on the Summer Camp Link Party. Love it ! Kudos to your genius.